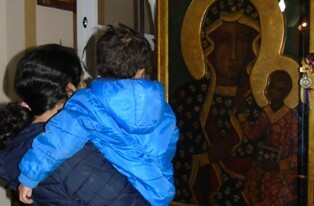 The name of the new group - "Our Lady of Czestochowa, the Pilgrim Mother of Poland"
Promoting moral and ethical values, as well as defending life from conception to natural death, are just some of the goals and objectives that the new parish group of the Parrish Santa Maria de El Calzado will initiate. The name of this group will be "Our Lady of Czestochowa, the Pilgrim Mother of Poland". The parish of Santa Maria de El Calzado is in a permanent prayer with the visiting Virgin of Czestochowa. 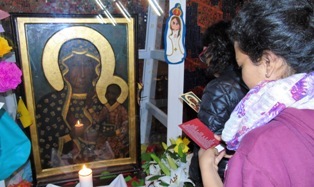 Every day at dusk parishioners gather in an attitude of rejoicing, enthusiasm, devotion and faith to be able to share time with the Pilgrim Icon. 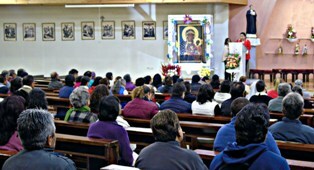 The pilgrim image of the Virgin of Czestochowa has gathered a large number of faithful from the parish community of Santa Maria de El Calzado. Every day people of faith came to the parish church to venerate the sacred image and ask for health, for life and for the families of that community. 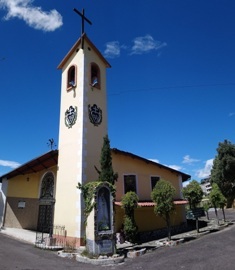 Our Lady the Virgin of Czestochowa visited the parish of Santa Maria de El Calzado, located south west of the city of Quito. During her visit, the Pilgrim Virgin shared with the parishioners the celebration of the Holy Eucharist. The parish priest Fr. Jorge Ortiz, presided over the celebration and in his homily he commented: "The Pilgrim Virgin invites us to leave our house. 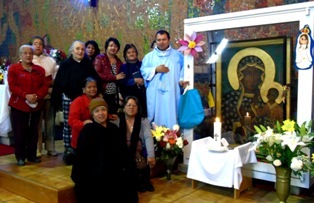 On August 24 the Pilgrim Virgin of Czestochowa visited the parish of St. Magdalena, located south of the city of Quito. The parish community received Her with happiness and rejoicing. 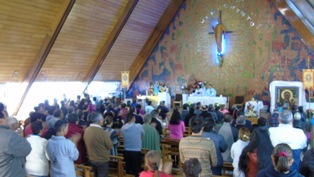 In the parish of Santa Ana, located to the south west of the city of Quito, the Holy Eucharist was celebrated and later an agape with the parishioners who attended the welcoming of Our Lady the Virgin of Czestochowa. The celebration was preceded by the parish priest Fr. Jose Alfonso Carvajal, who invited the community to welcome the Pilgrim Icon with open arms. 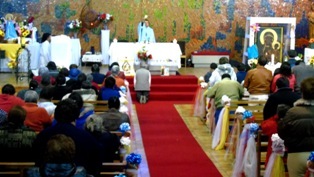 The Lord of Good Hope parish, located in the Villaflora sector south of the city of Quito, had the honor of receiving Our Lady the Virgin of Czestochowa. From August 15, the religious icon was located at the foot of the high altar. The Our Lady of Czestochowa visited the parish of "Cristo Salvador", located in front of the Chiriyacu Municipal Market, in the south of Quito. The visit took place from Monday the 13th to Wednesday the 15th of August. From August 2nd, the parish of Pilgrim Virgin of Puengasí "Virgen Peregrina de Puengasí" had the honor of hosting, and learning more about the image of Our Lady of Czestochowa. It is a representation of the most respected virgin in Poland and Europe, known as Black Madonna with the Infant Jesus in her arms. She is considered a symbol of motherly faith and love. The Christian tradition attributes the authorship of the original Icon to Saint Luke the Evangelist, who gives more details of the life of the Virgin Mary than the other Evangelists.